And now, Jindal’s party is putting him on a national platform, awarding the once little-known congressman the political plum of delivering the Republican’s televised response to President Barack Obama’s address to Congress on February 24. “The speech is very important. This is his coming-out party,” said G. Pearson Cross, head of the University of Louisiana’s political science department, who has observed Jindal’s political rise. “His speech will put a face on the name.” And put a fresh face on the Republican Party. The GOP, still reeling from election beatings in 2006 and 2008, is looking to revamp itself by rebuilding from the states up and reaching out to young voters. At 37, the popular Louisiana governor embodies that mission, experts say. “The job is very important in framing the Republican message really for the rest of the year,” said Nick Ayers, executive director of the Republican Governors Association, referring to the response speech Tuesday. “Gov. Jindal provides the outside-the-beltway, not D.C., perspective. And he’s one of the smartest policy minds in the country. He’s not perceived as a overtly political person.” Being tapped for this prime-time speech, a job normally for congressional leaders, has helped to elevate Jindal’s standing in the party dominated by old pros, including Senate Minority Leader Mitch McConnell and House Minority Leader John Boehner, as well as personalities, such as Alaska Gov. Sarah Palin and California Gov. Arnold Schwarzenegger. Why many consider Louisiana Governor Bobby Jindal to be the GOP’s new rising star. “It’s time for another generation to come into play,” said GOP strategist Ed Rollins, a CNN contributor. “A lot of Republicans came of age under Reagan, which was 25 years ago … and we just haven’t built on that with young people.” Rollins, a veteran of the Reagan White House, called Jindal, a first-generation American born to Punjabi parents, a “young dynamic governor” with “appeal to younger voters.” The governor is a “textbook Republican” who is “scary smart,” Cross added. And, having an accomplished minority figure represent your party’s message doesn’t hurt, he said. “The Republican Party very strongly wants to have a new look,” he said. “They’re saying, ‘We’re not just a party of old white guys’ and he’s part of that appeal.” Born Piyush Jindal in Louisiana’s capital, Baton Rouge, he called winning his first election in 2004 to the U.S. House of Representatives “the ultimate embodiment of the American dream.” He was only 33. By age 28, the former Rhodes Scholar had already served in three high-profile jobs, including head of Louisiana’s Department of Health and Hospitals and president of the University of Louisiana system. Aside from his rapidly paced career moves, his ethnic background and the making of his American identity have been points of interest. 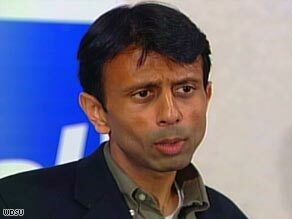 Jindal, while his legal name remains Piyush, publicly goes by “Bobby” — a nickname he reportedly picked up from the youngest “Brady Bunch” character as a preschooler. A Hindu by birth, he converted to Catholicism after his grandfather’s death. “Coming from a family of recent immigrants reflects the opportunities in this country, and that’s a principle the Republican Party represents,” said David Winston, a Republican pollster and strategist. Jindal, in a statement, said he is looking forward to hearing Obama’s address and that he’s honored to be delivering the Republican response immediately following the president’s speech. “Here in Louisiana, we have first-hand experience with reforming government and cutting taxes to stimulate our economy in uncertain times. This is a terrific opportunity to talk about our great state to the nation.” But Democrats say the problem is the message, not the messenger. “It doesn’t matter if it’s Gov. Jindal or Gov. Palin or Mitch McConnell,” said Democratic strategist Chris Kofinis. “At the end of the day, the policies they support are not the policies the American people support.” Obama is expected to focus on the economic crisis and the $787 billion stimulus bill among other issues during his first congressional address, and Jindal will likely rebut with a push for fiscal responsibility, Kofinis said. “He’ll probably flash back to the past, talking about fiscal responsibility and ignoring the fact that over the last eight years the Republicans have been the poster child for fiscal irresponsibility,” he said. The governor has been a vocal conservative critic of the stimulus package, highlighting what he considers waste at a White House meeting with governors on Monday. Jindal spoke to a large group of reporters after the session Monday, noting items such as $1 billion in added spending for the national census and $50 million in federal spending for the arts. It’s “not apparent to me why they had to be in the stimulus package,” said Jindal, while adding that his fellow Republican governors nevertheless wanted to give Obama “every opportunity” to succeed in sparking an economic recovery. Jindal has announced plans to reject $100 million of stimulus funding for his state, saying it would require Louisiana to change its unemployment laws. Several other governors have expressed similar concerns. Jindal made history in 2007 when, at 36, he was elected the nation’s first Indian-American governor and the youngest in office. And he drew major national attention last year when he was widely thought by pundits to be on then-Republican presidential John McCain’s short list for vice president. “All the elements of who he is make him an attractive figure, particularly with the difficulty Republicans had with attracting the youth vote,” Winston said. “Having a younger member of the party is something to be desired.” Palin got the job, though Jindal did not slip into obscurity with many analysts still looking to him as a potential presidential candidate. And although Jindal has said he’s focused on his job as governor, his presidential ambitions are “one of the worst kept secrets in Louisiana,” Kofinis said. Jindal was expected to headline the Republican National Convention in August, but canceled to oversee his state’s response to Hurricane Gustav. His state still recovering from Hurricane Katrina, Jindal ordered a mandatory evacuation and called up some 3,000 National Guardsmen to coordinate the exodus. Jindal’s actions were in stark contrast to former Louisiana Gov. Kathleen Blanco’s shaky and largely criticized reaction to Katrina. The little-known Jindal, who narrowly lost the 2003 gubernatorial election to Blanco, won the post outright in the 2007 primary with 54 percent of the vote. Republicans in Washington took notice. Boehner, R-Ohio, and McConnell, R-Kentucky, support the idea of Jindal serving as the official GOP spokesman Tuesday night. “Gov. Jindal embodies what I have long said: The Republican Party must not be simply the party of opposition, but the party of better solutions,” Boehner said when he announced that Jindal was slated to give the response. A recent CNN/Opinion Research Corporation survey indicates that Mike Huckabee and Sarah Palin top the list of potential 2012 Republican presidential hopefuls, attracting about one-third of Republicans and independents who lean toward the GOP, from among those surveyed. The survey is an early measure of possible support, not a horse-race snapshot. Jindal, falling behind former Massachusetts Gov. Mitt Romney, former House Speaker Newt Gingrich and former New York Mayor Rudy Giuliani, grabbed the backing of 19 percent. Florida Gov. Charlie Crist drew 7 percent. Analysts say Jindal lacked name recognition. Tuesday night’s speech will raise his profile.